How to make a ……. ? In patisserie. Did Chef ask you to make a Pâte à Bombe today? Are you confused when the recipe says make a Parfait? If your level of French today is what mine was a year ago then you’ve understood Chef asking you to make a Dough Bomb and a Perfect. Perfect what? And if you are new to French pastry then it’s even more confusing. The language of a French pastry lab is introduced during the Ferrandi program via the recipe book we receive. Recipes are written in English, however the professional titles of the recipes remain in French. And when I say recipes, I don’t just refer to the finished cake, I refer to the recipes within the recipe. Pommade? Normally referred to a beurre pommade. It’s softened butter. Keep it out of the fridge for more than half an hour and then mixed with an electric beater or hand whisk. Crème au beurre? Butter cream is sugar and water cooked to 121C and slowly poured over beating egg yolks (sometimes it’s eggs + egg yolks). Then a softened butter pommade is incorporated. You continue beating until you have a volume. Sirop 1260? It’s sugar syrup that’s 50% sugar and 50% water melted together to make a clear syrup. Many times the recipe will just ask you to make a syrup and it’s not necessarily 50/50 ratio. Syrup 1260, 120g (60g of sugar to 60g of water) melted over the stove. Pâte à Bombe? (also referred to as Sabayon) egg yolks and syrup. While beating eggs yolks in an electric mixer you pour the hot syrup in a thin stream onto the egg yolks (down the side of the bowl). Pouring down the side of the bowl prevents a thermic shock to the eggs. The eggs will become frothy (after 4-5 mins – touch the bowl it should have cooled down). A recipe may require you to add melted chocolate or a fruit puree. However, there is another way of doing Pâte à Bombe and that’s over the stove in a double boiler, syrup already made and you whisk the eggs together with the syrup, then you transfer to an electric mixer to cool down the mixture. Crème Mousseline: Pastry cream (crème patissiere) and butter cream (crème au beurre ou beurre pommade). Bavarois: Crème anglaise and whipped cream. Chiboust (crème Saint-Honoré): Crème pâtissière and meringue italieene. Traditionally used for the French dessert, Saint-Honoré and Soleil Indien. Crémeux: Is a crème anglaise preparation with softened butter added when the preparation has cooled down to say around 45C. The recipe may ask you to make for example, Cremeux Citron for a lemon tart. Crème Diplomate (mille-feuille cream): Crème pâtissière and crème fouettée (whipped cream). Parfait: It’s made of a Pâte à Bombe plus whipped cream. Usually a parfum (an alcohol) is added, some examples Amaretto, Grand Marnier, limoncello. Sabayon: egg yolks and sugar whisked at high speed to form a cream texture. Usually an alcohol is added. It’s also used for Tiramisu recipes. Tant pour Tant? 50% almond and 50% icing sugar. It can even be 3 ingredients, again all in equal amounts. Genoise: A sponge cake made of eggs, granulated sugar, sifted flour and butter is optional. Joconde: Like a Genoise but with added almond powder and icing sugar. We remember it as an “almond based” sponge. We have joconde recipes with added pistachio paste or cocoa powder for entremets, and even adding colouring for our sorbet/ice-cream cakes. Pain de Gene: It constitutes the ingredient Pate d’amande (almonde paste) (50%) or (70%) – In Australia I know it as Marzipan. G.Detou in Paris sells 50% concentration, supermarkets sell it at 30% concentration and if you want 70% that’s just available to professionals. I’ve used 50% and my pain de gene turn out beautiful. Dacquoise: It’s a sponge made of French meringue and almond powder. Sable: Sable means sandy. A sandy biscuit. It can be the base of a tart or entrement. Ganache: Consists of cream and/or butter. Craquelin (or la pâte a crumble): It’s cassonade sugar, flour and butter. It’s translation is cracking. One use is to put over choux for crunchiness. Imbibage: is a coating for the sponge cake (genoise, joconde, pain de gene) to make it moist and add taste. An imbibage can be made of syrup and an alcohol, or flavouring. For example, the Italian dessert Tiramisu, the biscuits are “imbibe” in coffee and a coffee alcohol. The biscuits soak these liquids up. 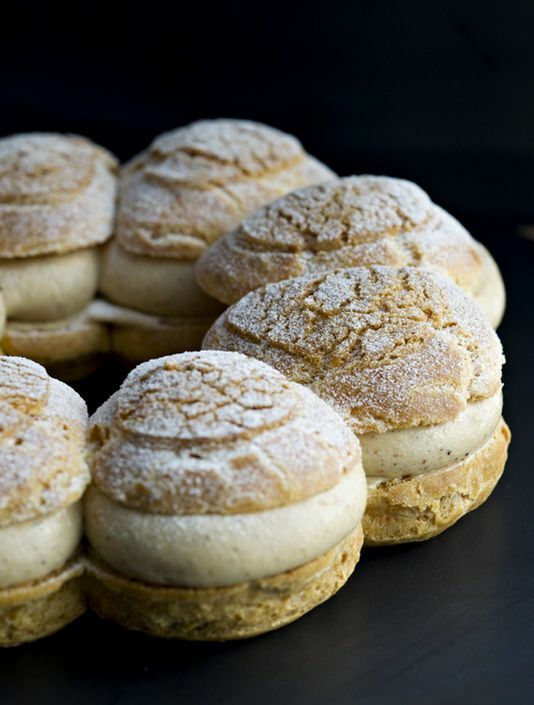 To make the famous French classic, Paris-Brest, you need to make the following recipes: La pate a choux, le craquelin (also known as la pate a crumble) et la creme mousseline. You’d think you are making 3 recipes but in fact we know for a creme mousseline we first need to make a creme patissiere and then a creme au beurre and together they make up our creme mousseline. Articles, Paris Patisseries, Italy, etc....., Ferrandi International Pastry Program, It's in French! Thankyou so much for your post it’s helped clarify my confusion over parfait and pate bombe! You’re welcome. By the way, thanks for the reminder. I must update this page, it’s been so long now since Ferrandi. Things are so much more clearer now with experience therefore more to add. Good luck to you too.